This book presents new developments in the study of the chemical stage of a radiobiological mechanism. The biological effect of ionizing particles in diploid cells depends on their linear energy transfer (LET) value. While for low-LET particles a pair of DSBs in the same sections of both the equal DNA molecules is to be formed by different particles in a relatively short irradiation interval, the increase of these DSB pairs at higher LET values is given by singular particles. This means that the radiobiological mechanism in physical and biological stages may be understood at least in principle, while the chemical stage represents a still rather open problem. It concerns basic process running in this stage as well as the influence of radiomodifying agents being present in a corresponding water medium during irradiation (mainly for low-LET radiation), which may be important in the regions of radiotherapy as well as radioprotection. It has been commonly assumed that this stage has been mediated by radical clusters formed by a densely ionizing end of secondary electrons. It is evident that only greater radical clusters (being able to form at least two SSBs in a given DNA molecule) may be efficient biologically. These clusters may originate, however, at different distances from DNA molecules present in a cell; they may meet a certain time after (due to heat motion and cluster diffusion). Consequently, the resulting biological effect may be influenced also by chemical processes running in diffusing clusters. A new model of corresponding cluster evolution (based on the use of a continuous Petri net and describing the concurrent influence of cluster diffusion and corresponding chemical reactions) will be presented and the possibility of its use in the analysis of a biological stage will be shown. On the basis of available data, the initial cluster characteristics (the emergence of water radicals) as well as the emergence of other radicals (if corresponding agents are present) may be established. The corresponding influence on the processes running in a biological stage may be estimated as well. Adams G. E., Chemical radiosensitization of hypoxic cells, Br. Med. Bull 29, pp. 48–53 (1973). Adams G. E., Hypoxic cell sensitizers for radiotherapy, Cancer 6, pp. 181–223 (1977). Alberts B., Johnson A., Lewis J., Raff M., Roberts K., Walter P., Molecular Biology of the Cell. Garland Science, New York, 4th ed. (2002). ISBN 0-8153-3577-6. Alizadeh, E., Cloutier, P., Hunting, D., Sanche, L., Soft X-ray and Low Energy Electron-Induced Damage to DNA under N2 and O2 Atmospheres. J. Phys. Chem. B. 115 (15), 4523-4531 (2011). ISSN 1520-6106, DOI: 10.1021/jp200947g. Alizadeh, E., Sanche, L., Induction of strand breaks in DNA films by low energy electrons and soft X-ray under nitrous oxide atmosphere. Radiation Physics and Chemistry. 81, 3339 (2012). ISSN 0969806x, DOI: 10.1016/j.radphyschem.2011.09.004. Alpen E. L., Radiation biophysics, Academic Press, San Diego, second edition (1997). ISBN: 9780120530854. Alper T., Howard/Flanders P., Role of oxygen in modifying the radiosensitivity of E. coli. Nature 178, pp. 978–979 (1956). Arena V., Ionizing Radiation and Life, C. V. Mosby, St. Louis, USA (1971). Attix F. H., Introduction to Radiological Physics and Radiation Dosimetry, John Wiley and Sons, Germany (1986). Barendsen G. W., Koot C. J., van Kersen G. R., Bewley D. K., Field S. B., Parnell C. J., The effect of oxygen on impairment of the proliferative capacity of human cells in culture by ionizing radiations of different LET. Int. Journal of Radiation Biology Relat Stud Phys Chem Med 10: 317–327 (1966). Barendsen G. W., LET dependence of linear and quadratic terms in dose-response relationships for cellular damage: correlations with the dimensions and structures of biological targets, Radiation Protection Dosimetry, 31, pp. 235–239. (1990). Barilla J., Lokajíček M. The role of Oxygen in DNA Damage by Ionizing Particles. Journal of Theoretical Biology, 207(3), pp. 405– 141 (2000). DOI: 10.1006/jtbi.2000.2188, ISSN 00225193. Barilla, J., Lokajíček, M., Pisaková, H., Simr, P., Simulation of the chemical phase in water radiolysis with the help of Petri nets. Curr Opin Biotechnol. 22, pp. S58-S59 (2011). ISSN 09581669. DOI: 10.1016/j.copbio.2011.05.162. Barilla, J., Lokajíček, M., Pisaková, H., Simr, P., Analytical model of chemical phase and formation of DSB in chromosomes by ionizing radiation. Australasian Physical & Engineering Sciences in Medicine. 36, pp. 11-17.ISSN 0158-9938. DOI: 10.1007/s13246-012-0179-4 (2013). Barilla, J., Lokajíček, M., Pisaková, H., Simr, P., Simulation of the chemical stage in water radiolysis with the help of Continuous Petri nets. Radiation Physics and Chemistry. 97, pp. 262-269. DOI: 10.1016/j.radphyschem.2013.12.019 (2014). 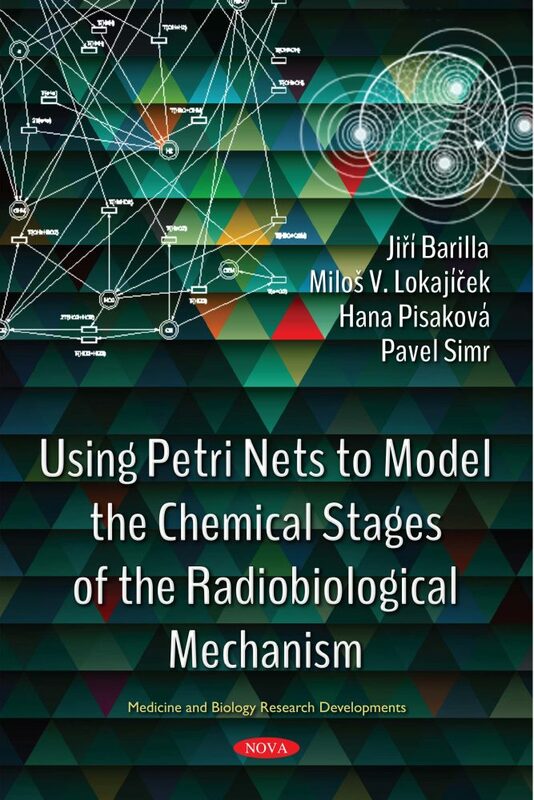 Barilla, J., Lokajíček, M., Pisaková, H., Simr, P., Applying Petri nets to modeling the chemical stage of radiobiological mechanism. Physics and Chemistry in Solids. 78, 127-136 (2015). DOI: 10.1016/ j.jpcs.2014.11.016. Barilla, J., Lokajíček, M., Pisaková, H., Simr, P., Influence of oxygen on the chemical stage of radiobiological mechanism. Radiation Physics and Chemistry. 124, 116-123, (2016). ISSN 0969806x.DOI: 10.1016/j.radphyschem.2016.01.035. Barilla, J., Lokajíček, M., Simr, P., Mathematical Model of DSB formation by Ionizing Radiation. http://arxiv.org/abs/0801.4880 (2008). Bethe H., Zur Theorie des Durchgangsschneller Korpuskula-rstrahlungdurch Materie [On the theory of the passage-velocity corpuscle-radiation through matter], Ann. Phys. 5, pp. 325-400 (1930). Beuve M., Colliaux A., Testa E., Theoretical limits of LEM, Proceedings of Ion Beams in Biology and Medicine (39. Annual Conference of the German-Swiss Association for Radiation Protection and 11th Workshop of Heavy Charged Particles in Biology and Medicine), pp. 204– 208. (2007). Beuve M., Colliaux A., Dabli D., Dauvergne D., Gervais B., Montarou G. Testa E., Statistical effects of dose deposition in track-structure modelling of radiobiology efficiency. Nuclear Instruments and Methods in Physics Research Section B: Beam Interactions with Materials and Atoms, 267, 6, pp. 983-988, (2009). DOI: 10.1016/ j.nimb.2009.02.016. BLN, Measuring the NSRL Beam Energy using the Bragg Curve. In: Brookhavn National Laboratory: NASA Space Radiobiology Program. [cited 2014-12-14]. (2008). Bloch F., Bremsvermogen von Atomenmitmehreren Elektronen [Braking characteristics of atoms with several electrons], 2. Phys., 8-L, pp. 363–376 (1933). Blok J., Loman H., The effects of c-radiation in DNA. Radiat. Res. 9, pp. 165–245 (1973). Buxton, G. V., High Temperature Water Radiolysis. Radiation Chemistry, ed. Jonah, C. D. and Rao, B. S. M. Elsevier, Amsterdam, pp. 145-162 (2001). DOI: 10.1016/S0167-6881(01)80009-4. Buxton, G. V., The Radiation Chemistry of Liquid Water. Charged Particle and Photon Interactions with Matter: chemical, physicochemical, and biological consequences with applications., ed. Mozumder, A. and Hatano, Y. New York, Marcel Dekker, pp. 331-363 (2004). ISBN 0824746236. Caldecott K. W., Eukaryotic DNA Damage Surveillance and Repair, Landes Bioscience and Kluwer Academic, New York, USA (2004). ISBN 0306479877. Carlsson G. A., Basic Concepts in Dosimetry. A Critical Analysis of the Concepts of Ionizing Radiation and Energy Imparted, Radiation Research 75: 3, pp. 462–470 (1978). Chadwick K. H., Leenhout H. P., A molecular theory of cell survival. Physics in Medicine and Biology 18, pp. 78–87 (1973). Chatterjee A., Holley W. R., Computer simulation of initial events in the biochemical mechanisms of DNA damage. Adv. Radiation Biol. 17, pp. 181–226 (1993). Chatterjee A., Maggie J. L., Dex S. K., The Role of Homogeneous Reaction in the Radiolysis of Water. Radiation Research 96, pp. 1-19, (1983). Cooper G. M., The Cell: A Molecular Approach, Sinauer Associates, Inc., Boston, USA (2000), ISBN 978-1-60535-290-9. Cucinotta F. A., Pluth J. M., Anderson J. A., Harper J. V., O’Neill P., Biochemical kinetics model of DSB repair and induction of gamma-H2AX foci by non-homologous end joining. Radiat Res. 169(2): pp. 214–22 (2008). ISSN: 0033-7587. DOI:10.1667/RR1035.1. Curtis S. B., Lethal and Potentially Lethal Lesions induced by radiation - A Unified Repair Model, Radiation Research, 106 (2), pp. 252–270. (1986). Dale R. G., The application of the linear-quadratic dose effect equation to fractionated and protracted radiotherapy. British Journal of Radiology 58, pp. 515–528. (1985). David R., Alla H., Discrete, Continuous and Hybrid Petri nets. Springer-Verlag (2005). ISBN: 978-3-540-22480-8. Deppman A. et al., Radiation interaction with DNA. Brazilian J. of Physics 34, pp. 958–61 (2004). ISSN 0103-9733, DOI: 10.1590/S0103-97332004000500068. Drath R., Visual Object Net++. http://www.techfak.uni-bielefeld.de/ mchen/BioPNML/Intro/VON.html (1993). Ewing D., The oxygen fixation hypothesis - A reevaluation. American Journal of Clinical Oncology - Cancer Clinical Trials 21 (4), pp. 355–361 (1998). Featherstone C., Jackson S. P., Ku, a DNA repair protein with multiple cellular functions? Mutation Research DNA repair 434: 1, pp. 3–15 DOI: 10.1016/S0921-8777(99)00006-3 (1999a). Featherstone C., Jackson S. P., DNA double-strand break repair. Current Biology, 9 (20), pp. R759–R761 (1999b). ISSN 09609822, DOI: 10.1016/S0960-9822(00)80005-6. Frankenberg-Schwager M., Frankenberg D., Bloecher D., Adamczy C., The linear relationship between DNA double-strand breaks and radiation dose 30 MeV electrons is converted into a quadratic function by cellular repair. Int. J. Radiat. Biol. 37, pp. 207–212 (1980). Gervais B., Beuve M., Olivera G. H., Galassi M. E., Numerical simulation of multiple ionization and high LET effects in liquid water radiolysis. Radiation Physics and Chemistry, 75: 4, 493–513 (2006). ISSN 0969806x, DOI: 10.1016/j.radphyschem.2005.09.015. Goodhead D. T., Thacker J., Cox R., Effectiveness of 0.3 keV carbon ultrasoft X-rays for the inactivation and mutation of cultured mammalian cells. Int. J. Radiat. Biol. 36, pp. 101–114 (1979). Gray L. H., Conger A. D., Ebert M., Hornsey S., Scott O. C. A., The Concentration of Oxygen Dissolved in Tissues at the Time of Irradiation as a Factor in Radiotherapy. British Journal of Radiology 26 (312): pp. 638-648 (1953). Gu T., Dong R., A novel continuous model to approximate time Petri nets: Modelling and analysis. Int. J. Appl. Math. Comput. Sci. 15, 1, pp. 141-150 (2005). Hall E. J., Giaccia A. J., Radiobiology for the Radiobiologist. Lippincott Williams and Wilkins, USA (2006). ISBN: 9780781741514. Hart E. J., PlatzmanR. L., Radiation Chemistry. Mechanisms in Radiobiology, ed. Errera, M. and Forssberg, A. New York, Academic Press, pp. 93-257 (1961). Hervé du Penhoat M. A., Goulet T., Frongillo Y., Fraser M. J., Bernat P., Jay-Gerin J. P., Radiolysis of Liquid Water at Temperatures up to 300°C: A Monte Carlo Simulation Study. The Journal of Physical Chemistry A. 104(50), pp 11757-11770, (2000). ISSN 1089-5639, DOI: 10.1021/jp001662d. Holley W. R., Chatterjee A., Clusters of DNA induced by ionizing radiation: formation of short DNA fragments. I. Theoretical modeling. Radiat Res. 145(2): pp. 188–199 (1996). Hromčíková H., Počítačová simulace postupných fází radiobiologického mechanismu v buňkách a tkáních [Computer simulation of sequential phases of radiobiological mechanism in cells and tissues], diploma thesis, Faculty of Mathematics and Physics, Praha (2003). ICRU: Stopping Powers and Ranges for Protons and Alpha Particles. Report 49. Washington, DC, International Commission on Radiation Units and Measurements, (1993). Ikpeme S., Löbrich M., Akpa T., Schneider E., Kiefer J., Heavy ion-induced DNA double-strand breaks with yeast as a model system, Radiat Environ Biophys. 34(2): pp. 95–99 (1995). Iliakis G., Kurtzman S., Mechanism of radiosensitization by halogenated pyrimidines: Bromodeoxyuridine and betaarabinofuranosyladenine affect similar subsets of radiation-induced potentially lethal lesions in plateau-phase Chinese hamster ovary cells, Radiat Res. 127: 1, pp. 45-51 (1991). Iliakis G., Wang H., Perrault A. R., Boecker W., Rosidi B., Windhofer F., Wu W., Guan J., Terzoudi G., Pantelias G., Mechanisms of DNA double strand break repair and chromosome aberration formation. Cytogenetic and Genome Research 104(1-4): pp. 14–20 (2004). ISSN 1424-8581, DOI: 10.1159/000077461. Iyer R., Pluciennik A., Burdett V., Modrich P., DNA mismatch repair: functions and mechanisms. Chemical Reviews. 106 (2), pp. 302-323 (2006). DOI: 10.1021/cr0404794. James F., Roos M., MINUIT*a system for function minimization and analysis of parameter errors and correlations. Comput. Phys. Commun. 10, pp. 343–367 (1975). James F., Function Minimization and Error Analysis. CERN, Geneva, Switzerland, (1998). Judas L., Lokajíček M., Cell inactivation by ionizing particles and the shapes of survival curves. Journal of Theoretical Biology 210 (1), pp. 15–21 (2001). ISSN 00225193, DOI: 10.1006/jtbi.2001.2283. Kraft G., Scholz M., Bechthold U., Tumor therapy and track structure. Radiation and Environmental Biophysics 38 (4), pp. 229–237 (1999). ISSN 0301-634x, DOI: 10.1007/s004110050163. Kronenberg A., Gauny S., Criddle K., Vannais D., Ueno A., Kraemer S., Waldren C. A., Heavy ion mutagenesis: linear energy transfer effects and genetic linkage. Radiat Environ Biophys. 34(2): pp. 73–78 (1995). Kundrát P., Lokajíček M., Hromčíková H., Probabilistic two-stage model of cell inactivation by ionizing particles; Physics in Medicine and Biology, 50 (7), pp. 1433–1447 (2005). ISSN 0031-9155, DOI: 10.1088/0031-9155/50/7/007. LaVerne J. A., Pimblott S. M., Scavenger and Time Dependences of Radicals and Molecular Products in the Electron Radiolysis of Water: examination of experiments and models. The Journal of Physical Chemistry. 95(8), pp. 3196-3206, (1991). ISSN 0022-3654, DOI: 10.1021/j100161a044. Löbrich M., Rydberg B., Cooper P. K., Repair of X-ray induced DNA double-strand breaks in specific Not I restriction fragments in human fibroblasts: joining of correct and incorrect ends, Proceedings of the National Academy of Sciences of the U S A. 92(26): pp. 12050–12054 (1995). Lodish H., Berk A., Matsudaira P., Kaiser C. A., Krieger M., Scott M. P., Zipursky S. L., Darnell J., Molecular Biology of the Cell, 5th ed. W. H. Freeman and Company: New York (2005). ISBN 0716743663. Lokajíček M., Mathematical and physical models of the biological effect of ionizing particles on cells and tissues. Internal report of Institute of Physics, AVCR, Prague, report FZU-81-5 (in Czech) (1981). Lokajíček M., Biophysical mechanism of cell inactivation by ionizing particles. Internal report of International Centre for Theoretical Physics, IC/86/399 (1986). Michael B. D., Adames G. E., Hewitt H. B., A post-effect of oxygen in irradiated bacteria: a submillisecond fast mixing study. Radiation Research 54: pp. 239–251 (1973). Michaels H. B., Hunt, J. W., A Model for Radiation Damage in Cells by Direct Effect and by indirect Effect. Radiation Research 74, pp. 23–34, (1978). Michael B. D., Prise K. M., A multiple-radical model for radiation action on DNA and the dependence of OER on LET. Int. J. Radiat. Biol. 69, pp. 351–358 (1996). Milligan J. R., Ng J.Y-Y., Wu C. C. L., Aguilera J. A., Fahey R. C., Ward, J. F., DNA repair by thiolos in air shows two radicals make a double-strand break. Radiat. Res. 143, pp. 273–280 (1995). Mozumder A., Magee J. L., Model of Tracks of Ionizing Radiations of Radical Reaction Mechanisms. Radiation Research 28, pp. 203–214 (1966). Mozumder A., Hatano, Y., Charged Particle and Photon Interactions with Matter. New York, Marcel Dekker (2004). ISBN: 9780203913284. Nagasawa H., Little J. B., Induction of chromosome aberrations and sister chromatid exchanges by X rays in density inhibited cultures of mouse 10T1/2 cells. Radiat Res. 87(3): pp. 538–551 (1981). Olinski R., Nackerdien Z., Dizdaroglu M., DNA-protein cross-linking between thymine and tyrosine in chromatin of gamma irradiated or H2O2-treated cultured human cells. Arch Biochem Biophys. 297(1): pp. 139–143 (1992). Petry E., ZurKenntnis der Bedingungen der biologischen Wirkung der Rontgenstrahlen [Recognizing the conditions of the biological effect of the X-ray beams]. Biochem Zeitschrift, 135, 353 (1923). Pikajev A. K., Sovremennaja Radiacionnaja Chimija. Moskva: Nauka (1986). Pimblott, S. M., Mozumder, A., Modeling of Physicochemical and Chemical Processes in the Interactions of Fast Charged Particles with Matter. Charged Particle and Photon Interactions with Matter (2004). ISBN 978-0-8247-4623-0, DOI: 10.1201/ 9780203913284.ch4. Platzman R., Conference on basic mechanisms in radiation biology, National Research Council Publication 305. National Academy of Sciences, Washington DC, (1953). Politi A., Mon M. J., Houtsmuller A. B., Hoogstraten D., Vermeulen W., Heinrich R., van Driel R. Mathematical modeling of nucleotide excision repair reveals efficiency of sequential assembly strategies. Molecular Cell. 19(5): pp. 679–90 (2005). ISSN 10972765, DOI: 10.1016/j.molcel.2005.06.036. Prise K. M., Davies S., Michael B. D., Evidence for induction of DNA double-strand breaks at paired radical sites. Radiat. Res. 134, pp. 102–106 (1993). Resnick M. A., Martin P., The repair of double strand breaks in the nuclear DNA of Saccaromyces cerevisiae and its genetic control. Mol. Gen. Genet. 143, pp. 119–129 (1976). Resnick M. A., The repair of double-strand breaks in DNA, a model involving recombination. J. Theor. Biol. 59, pp. 97–106 (1976). Sachs R. K., Hahnfeld P., Brenner D. J., Review The link between low-LET dose-response relations and the underlying kinetics of damage production/repair/misrepair. Int. J. Radiat. Biol, 72, 4, pp. 351– 374 (1997). Sauer C. M., Schmidt K. H., Jonah CH. D., Naleway C. A., HART E., High-LET Pulse Radiolysis: O2 and oxygen production in tracks. Radiat. Res. 75, pp. 519–528 (1978). Semenenko V. A., Stewart R. D., Monte Carlo simulation of base and nucleotide excision repair of clustered DNA damage sites. II. Comparisons of model predictions to measured data. Radiation Research. 164(2): pp. 194–201 (2005). DOI: 10.1667/RR3414. Semenenko V. A., Stewart R. D., Ackerman E. J., Monte Carlo simulation of base and nucleotide excision repair of clustered DNA damage sites. I. Model properties and predicted trends. Radiation Research. 164(2): pp. 180–93 (2005). DOI: 10.1667/RR3402. Van derSchans G. P., Vost O., Roos-Verhij W. S. D., Lohman P. H. M., The influence of oxygen on the induction of radiation damage in DNA in mammalian cells after sensitization by intracellular glutathion depletion. International Journal of Radiation Biology. 50(3), pp. 453–465 (1986). ISSN 0020-7616, DOI: 10.1080/ 09553008614550861. Scholz M., Kraft G., Track structure and the calculation of biological effects of heavy charged particles. Adv. Space Research, 18, 1/2, pp. 5–14 (1996). Scholz M., Kellerer A. M., Kraft-Weyrather W., Kraft G., Computation of cell survival in heavy ion beams for therapy - The model and its approximation, Radiation Environmental Biophysics, 36, pp. 59–66 (1997). Scholz M., Elsässer T., Biophysical models in ion beam radiotherapy. Advances in Space Research 40(9), pp. 1381-1391 (2007). ISSN 02731177, DOI: 10.1016/j.asr.2007.02.066. Schwarz H. A. J., Application of the Spur Diffusion Model to the Radiation Chemistry of Aqueous Solutions. J. Phys. Chem. 73, pp. 1928-37 (1969). Setlow J. K., Photo reactivation, Radiation Research Supplement, Vol. 6, Structural Defects in DNA and Their Repair in Microorganisms, Proceedings of a Conference on Radiation Microbiology, University of Chicago, Chicago, Illinois, October 18-20, 1965, 141–155 (1966). Silva M., Júlvez J., Mahulea C., Vázquez C. R., On fluidization of discrete event models: observation and control of continuous Petri nets. Discrete Event Dynamic Systems. 21(4), pp. 427-497 (2011). ISSN 0924-6703, DOI: 10.1007/s10626-011-0116-9. Silva M., Recalde L., On fluidication of Petri net models: from discrete to hybrid and continuous models. Annual Reviews in Control. 2(28), pp. 253-266 (2004). Solov’yov A. V. et al., Physics of ion beam cancer therapy: A multiscale approach. Physical Review E [online]. 2009, 79(1). DOI: 10.1103/PhysRevE. 79.011909. ISSN 1539-3755. Steel G. G., Basic Clinical Radiobiology, Edward Arnold Publishers, London (1993). ISBN 9780340601440. Stewart R. D., Two-Lesion Kinetic Model of Double-Strand Break Rejoining and Cell Killing. Radiation Research [online]. 2001, 156(4), 365-378 [cit. 2017-02-21]. ISSN 0033-7587, DOI:10.1667/ 0033-7587(2001)156[0365: TLKMOD]2.0.CO;2. Swiatla-Wojcik D., Buxton G. V., Modeling of radiation spur processes in water at temperatures up to 300.degree. The Journal of Physical Chemistry [online]. 1995, 99(29), 11464-11471. ISSN 0022-3654, DOI: 10.1021/j100029a026. Takata M., Sasaki M. S., Sonoda E., Morrison C., Hashimoto M., Utsumi H., Yamaguchi-Iwai Y., Shinohara A., Takeda S., Homologous recombination and non-homologous end-joining pathways of DNA double-strand break repair have overlapping roles in the maintenance of chromosomal integrity in vertebrate cells. The EMBO Journal [online]. 1998-9-15, 17(18), 5497-5508.ISSN 0261-4189, DOI: 10.1093/emboj/17.18.5497. Taucher-Scholz G., Heilmann J., Schneider M., Kraft G., Detection of heavy-ion-induced DNA double-strand breaks using static-field gel electrophoresis. Radiation and Environmental Biophysics [online]. 1995, 34(2), 101-106. ISSN 0301-634x, DOI: 10.1007 /BF01275214. Thames H. D., An ‘Incomplete-repair’ Model for Survival after Fractionated and Continuous Irradiations. International Journal of Radiation Biology and Related Studies in Physics, Chemistry and Medicine [online]. 2009, 47(3), 319-339. ISSN 0020-7616, DOI: 10.1080/09553008514550461. Tobias C. A., Blakely E. A., Ngo F. Q. H., Yang T. C. H., The Repair-Misrepair Model of cell survival, In Radiation Biology and Cancer Research (R. A. Meyn and H. R. Wihters, Eds. ), pp. 195–230, Raven Press, New York (1980). Tobias C. A., The Repair-Misrepair Model in radiobiology: Comparison to other models, Radiation Research, 104, Suppl. 8, S-77–S-95 (1985). DOI: 10.2307/3583515. Turner, J. E. Atoms, radiation, and radiation protection. 3rd completely rev. and enl. ed. Weinheim: Wiley-VCH, c2007. ISBN 3527406069. Uehara S., Nikjoo H., Monte Carlo Simulation of Water Radiolysis for Low-energy Charged Particles, Journal of Radiation Research, 47: 1, pp. 69–81 (2006). DOI: 10.1269/jrr.47.69. Ulmer W., Theoretical aspects of energy–range relations, stopping power and energy straggling of protons. Radiation Physics and Chemistry [online]. 2007, 76(7), 1089-1107. DOI: 10.1016/j.radphyschem.2007.02.083. Wang C-K. C., Zhang X., A nanodosimetry-based linear-quadratic model of cell survival for mixed-LET radiations. Physics in Medicine and Biology [online]. 2006, 51(23), 6087-6098. DOI: 10.1088/0031-9155/51/23/010. ISSN 0031-9155. Ward J. F., Biochemistry of DNA lesions, Radiation Research Supplement. Vol. 8, Heavy Charged Particles in Research and Medicine. Proceedings of a Symposium Held at the Lawrence Berkeley Laboratory, University of California, Berkeley, California, May 1-3, 1985 (Nov., 1985), pp. S103-S111. DOI: 10.2307/3583517. Ward J. F., Mechanisms of Radiation Action on DNA in Model Systems - Their Relevance to Cellular DNA. The Early Effects of Radiation on DNA [online]. Berlin, Heidelberg: Springer Berlin Heidelberg, 1991, s. 1. ISBN 978-3-642-75150-9, DOI: 10.1007/978-3-642-75148-6_1. Ward J. F., Radiation mutagenesis: the initial DNA lesions responsible, Radiat Res. 142(3): 362–368 (1995). Erratum in: Radiat Res 143(3): 355 (1995). DOI: 10.2307/3579145. Watanabe R., Saito K., Monte Carlo simulation of water radiolysis in oxygenated condition for monoenergetic electrons from 100eV to 1MeV. Radiation Physics and Chemistry [online]. 2001, 62(2-3), 217-228. ISSN 0969806x, DOI: 10.1016/S0969-806X(01)00195-5. Weyrather W. K., Ritter S., Scholz M., RBE for carbon track-segment irradiation in cell lines of differing repair capacity. International Journal of Radiation Biology [online]. 75(11), 1357-1364, (2009). ISSN 0955-3002, DOI: 10.1080/095530099139232. Yamashita S., Katsumura Y., Linc M., Muroyad Y., Miyazakia T., Murakami T., Water radiolysis with heavy ions of energies up to 28 GeV. 1. Measurements of primary g values as track segment yields, Radiation Physics and Chemistry, 77: 4, pp. 439–446 (2008). ISSN 0969806x, DOI: 10.1016/j.radphyschem.2007.07.005. Ziegler J. F., The stopping of energetic light ions in elemental matter, J. Appl. Phys/Rev. Appl. Phys., 85, pp. 1249–1272 (1999). DOI: 10.1063/1.369844.